Braces are difficult enough as a child, but trying to wear braces as an adult can be even more frustrating. You’ve worked hard to get where you are now, and metal braces can get in the way of a fluid lifestyle. Traditional braces can also take several years before your smile is straight. Fortunately, there is another way to correct crooked teeth, gaps, and other misalignments without clunky metal braces. Dr. Montz, Dr. Maher, and Dr. Dunwody and their team offer several types of orthodontic treatments here at our Pearland, TX office. Six Month Smiles is our fastest orthodontic treatment, a revolutionary treatment created to straighten teeth quickly and discreetly. We are excited to provide this system to our patients. Six Month Smiles isn’t complicated, just different from the traditional treatment. Traditional orthodontics are designed to correct the alignment of all your teeth, as well as your bite. With Six Month Smiles, the system focuses on correcting only the teeth that show when you smile. The system works by using low, continuous force on specific areas of your smile, allowing the treatment to work efficiently and quickly. The result saves time and will still give you the beautifully straight smile you’ve always wanted. When you first come in for a consultation, our team will take a thorough evaluation of your teeth and to see if the Six Month Smiles program will work for you. Once we’ve decided you’re a viable candidate, we’ll create a treatment plan that includes brief follow-up visits so that we can track your process. All that’s left is to place your new Six Month Smiles braces! As for the look of your smile, the braces are made with clear brackets and tooth-colored wires to make them less noticeable. 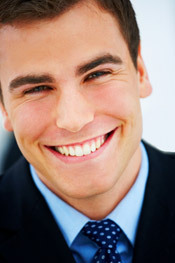 After six months, you can have a stunning and more confident smile! CALL OUR OFFICE today to schedule an appointment for friendly and experienced orthodontic dentistry!